The votes are in and The world has decided! These are your most favorite paranomal investigators in America or possibly the world. Brad Steiger is an American writer and paranormal researcher. His many works take us to strange far away places. They often open and bring us a deeper understandings of a truly paranormal world made normal. Steiger is also an award-winning writer with more than five decades of experience exploring the highly strange activities associated with miricales, supernatural phenomena, paranormal and unusual occurences. He is the author of Conspiracies and Secret Societies; Real Ghosts, Restless Spirits, and Haunted Houses; and The Werewolf Book. And considered the number #1 expert in the field of the paranormal research and investigation. His vast knowledge is shared among the pages of over 160 books, and "Real Vampires, Night Stalkers and Creatures of the Darkside" is his latest Number One Bestseller to date. Steiger was born on 19 February 1936. And is considered one of their most notabnle nativies to the town of Fort Dodge, Iowa. Growing up in Iowa was an experience that forever marked his personal being with the real scars of understanding and eye opening insights that he still relates to us today. His youth had a profound effect on his beliefs in the stenge other worldly occurences of unexplained mysteries, and the paranormal. Steiger's first published articles on the unexplained mysteries of our world appeared in 1956, and he since then he has now written over more than 2,000 articles with paranormal, or supernatural themes. From 1970-'73, his weekly newspaper column, The Strange World of Brad Steiger, was carried domestically in over 80 newspapers and overseas from Bombay to Tokyo. The internationl acclaim it brought to him still shines brightly today. Photo above: Brad Steiger and is lovely wife Sherry Hansen Steiger. Sherry herself is the author or co-author of over 40 books. From the mid-1980s through 2002, they lectured and conducted seminars throughout the United States and overseas. They have two sons, three daughters, and nine grandchildren, eight girls, and one boy. Steiger is a former high school teacher, and college instructor. He began writing when he was a school teacher in his native Iowa when he had writings published in Fate Magazine and other publications. Throughout the 1960s Steiger co-wrote 22 books with other writers. Steiger claims to be politically independent, and cynical of politics. He lists his political heroes, however, as Jonathan Swift, Benjamin Franklin, and Thomas Jefferson. When asked about individuals he admired, Steiger listed Ralph Waldo Emerson, Johann Wolfgang von Goethe, Mark Twain, William Shakespeare, Jesus Christ, Mary Magdalene, William James, Fredric W.H. Myers, Rudolf Steiner, Sir William Crookes, and Mario Lanza as those he would have liked to have met. Motion Pictures: In 1977, Steiger's bestselling biography of the great silent screen lover Valentino was made into a motion picture by British director Ken Russell, starring Rudolf Nureyev. In that same year, Steiger co-scripted the documentary film Unknown Powers [with Jack Palance as narrator], winner of the Film Advisory Board's Award of Excellence for 1978. Atlanta Journal Constitution: "Steiger does not talk in the agitated voice of an alarmist...or a gloom and doom spokesman. He speaks slowly and calmly...His contact with other intelligences does not make him feel special. They have showed him that we are all one." 42. The Underpeople (with Warren Smith, writing as Eric Norman) .New York: Award Books, 1969. 87. The World Beyond Death. Norfolk, VA: Donning Publishing Co., 1982. Dale D. Kaczmarek, PRESIDENT:Ghost Research Society, oversees all functions of the main branch located in Oak Lawn, Illinois. He currently publishes and edits The Journal and formerly the Ghost Trackers Newsletter, directs "Excursions Into The Unknown, Inc." and coordinates the Midwest Ghost Exposition. Editor of Ghost Trackers Newsletter, Author of "Windy City Ghosts" and "Windy City Ghosts 2", "A Field Guide to Spirit Photography", "Illuminating the Darkness: The Mystery of Spooklights", Bibliography of Ghost Movies, Ghostly Websites, Glossary of Occult Terms, Greater Chicagoland and Northwest Indiana Psychic Directory, International Directory of Psychic Sciences, National Catalog of Occult Bookstores, National Register of Haunted Locations, Occult Publications Directory. © 1997/2009 Dale Kaczmarek. All rights reserved. Patti sets out to find and document paranormal activity in the field of ghost hunting. Her investigative research for ghosts includes electromagnetic field detection, observing electrostatic field disturbances, capturing anomalous images with infrared videography, 3-D photography, digital photography, 35 mm photography, motion detector camera, recorded EVPs (Electronic Voice Phenomena) with audio recording devices, monitoring the temperature with infrared thermometers, along with other advanced techniques to collect data. Patti also includes prayers of protection before and after the investigation along with metaphysical tools to assist as well. She brings the science and the sensitive together to complete her success in ghost hunting. Patti has been involved in ghost hunting for years and decided in 1996 to formally organize her own group of ghost hunters. She is currently teaching “Introductory to Ghost Hunting” and “Advanced Ghost Hunting” at the Bluegrass Community and Technical College. For those who would rather finish these same LCC classes in one day can take her all-day Saturday intro class or the all-day Sunday advanced/certification class at her Ghost Hunter Shop location, 835 Porter Place, Lexington, KY.
Certified Ghost Hunter Home Study Course is offered by Patti as well. You can click here to read about the course and the many tools she has to offer you in developing your skills as a ghost hunter. Patti is currently touring with, workshops, ghost hunting get-a-way weekends, ghost walks, and performing on the college circuit with world renowned Phychic Medium, Chip Coffey . Patti is the President and owner of GCI (Ghost Chasers International, Inc.), which was founded in 1996 and is based in Lexington, Kentucky. She leads an experienced, accomplished, group of investigators with a goal to prove that life goes on even after death. Her team sets out to find and document paranormal activity in the field of ghost hunting. She has been written about in several magazines and newspapers, appeared on local and national TV shows. The investigative research for ghosts includes electromagnetic field detection, observing electrostatic field disturbances, capturing anomalous images with infrared videography, 3-D photography, digital photography, 35 mm photography, recorded EVPs (Electronic Voice Phenomena) with audio recording devices, monitoring the temperature with laser thermometers, along with other advanced techniques to collect data. Patti also includes prayers of protection before and after the investigation along with metaphysical tools such as dowsing to assist as well. She brings the science and the sensitive together to complete her success in ghost hunting. Being raised in a strict Baptist environment in Wellford South Carolina, until she was sixteen years old, Patti (Russell) Starr realized early that there was much more to life than the boundaries presented to her. The author struggled with the facts given to her about life and death for many years while trying to make sense of the unsolved mysteries of other unknown forces. Knowing that she wanted to understand more about the taboo subject of death, dying, the soul and the spirit world, fed her curiosity to search for more answers. Over the last few years, Patti became very active in researching and conducting ghost investigations. Her sightings, conversations and visitation with ghosts and spirits began to put more meaning into her understanding of life and death situations. Her study of the spirit world involves scientific procedures as well as a spiritual approach. The combination of these two methods, the science and the sensitive, has yielded many wondrous effects. Patti has been featured on many local and national television programs throughout the US. She was featured on the Food Network, the “Best of” during a show called, “The Best of Food Fright” which was filmed at the haunted historic Talbott Tavern in Bardstown, Kentucky. Patti has also been featured with world renowned Psychic/Medium Chip Coffey, (www.chipcoffey.com) also a former resident of Spartanburg, South Carolina, on the A&E Network, “Airline” filmed while they conducted a ghost investigation in Birmingham, Alabama, at the haunted Sloss Furnaces. Patti Starr and Chip Coffey are a Ghost Chaser Team and are available for bookings through GP Entertainment. They are now seen all over the US on the College Circuit. Their PowerPoint program consists of numerous photographs, videos and audio recordings captured during investigations of haunted locations ... as well as chilling stories of all their ghostly encounters! "The ARC ~ Alternate Realities Center", founded in February 1994, was created by The ARC Founder and International Director, Stacey Allen McGee. The organization is based in the small town of Unicoi nestled in Southern Appalachian Mountains near Johnson City, Tennessee which is located in upper eastern region of the State. The ARC holds area meetings to discuss all manner of the paranormal, offers an alien abduction support group, and offers several walking tours for area residents and area travelers who find themselves passing through the Southern Appalachian Mountains and wish to learn more about our rich history and urban legend, as well as the art and science of ghost hunting. In recent interview, the founder of The ARC has express that to describe me, is to describe my work. The ARC explores the world of unexplained mysteries, engaging phenomena that do not necessarily fit conventional scientific models, while maintaining a strong commitment to scientific methodology and procedures with efforts to focus on the Human equation. Our mission is to continuously represent new inspiration for new paradigm thinking and ideas in an effort to bring about new directions for the potentials of human consciousness, while bringing about a broader sense of self-awareness. "The ARC" is not a cult, single-cause institute, or political action group. However, the organization does consider the study of phenomena with unexplained origins which manifest themselves in the reality of this physical world to be of utmost importance to our further mental and spiritual development as a species in the cosmic scheme of life. Reality is not always quantifiable. Just because something can not be measured, cataloged, or photographed does not mean that it does not exist. However, The ARC utilizes sensitive electronic equipment to document paranormal activity when and where ever possible. Although not exactly proven, yet theorized by known science, we assume that our Universe is one of many and that each Universe has many levels of existence; In other words, it is multiplanar. In this we may extrapolate that there could be many different 'realities'. Furthermore, the organization embraces and celebrates the individual differences of Human beings, recognizing that one individual's perception of the Universe may not be that of another's. "The ARC" sponsors public awareness events as a means by which we may acknowledge the complexity of the known Universe. Our primary purpose is the attempt to present data and scientific evidence that will alter the 'paradigms' of our modern society. Those who are not familiar with this term will be happy to know that a 'paradigm', in its most basic sense, is a 'mental map'. It is the way we perceive, understand, and interpret the world around us. It may also be defined as the accepted 'truth' about the way all things are suppose to be, or behave. Often, the accepted way of doing things, or the way we think about our world invokes frustration as it becomes no longer convenient, or appropriate to suit our immediate need. The desire for change often leads us to open our eyes, as well as our minds, and search beyond the accepted truth. When the act of looking 'outside the box' inspires a 'change of mind', we refer to this as a 'paradigm shift'. Over the years, The ARC, and it's progenitors ~ the United States UFO Information and Research Center, the Southern Appalachian UFO Network, the Northeast Tennessee UFO Network, and the Northeast Tennessee Mutual UFO Network, have had a number of articles and other media coverage. The ARC has had stories in several publications, but when we were published in first and collector's edition of the magaizine "X-Pose'", a magazine published and distributed in several countries in Europe and Canada, we were simply overjoyed. We were in good company as we shared this first edition publication with Gillian Anderson and David Duchovny of the X-Files. Also, The ARC was featured on the Emmy Award winning television documentary "Liars and Legends" hosted by Grammy Award winner Bubba Knight. An archive of our newspaper and magazine articles, television and radio interviews, and other past media attention will appear on our website soon. Have you experienced things in your home you can’t explain? Perhaps you have heard noises that go "bump" in the night, or have unusual cold spots in your home? Ever been walking in the forest and saw a footprint, or a creature you could not find in a zoological catalogue? Have you seen unusual objects in the day, or night time sky and would like to talk with someone? Ever had an episode of unexplained time loss, otherwise known as "missing time"? CONTACT US - we are here to help. The organization most certainly encourages individual exploration of both the 'outer' as well as the 'inner' world. Our focus is to promote and maintain global awareness and open mindedness, broadening our scope of acceptance as a species to what is possible in the Universe. In support of our purpose and goals, with "The ARC" approaching it thirteenth anniversary, one could best describe the organization by its more than a decade-old motto... "People helping people to find the truth". "Appalachian GhostWalks" was created by The ARC Founder who also serves as the Tour Director. Stacey Allen attended school for Tourism at the National Career Institue in Tampa, Florida in 1988 through 1989. He has worked in the travel industry for many years and is assisted by two volunteer staff members ~ Michael W. Combs, CGH and Susan E. James, CGH. Both officers volunteer their time to help develop and present an educational, enlightening, and entertaining experience on each of our walking tours. The ARC also offers a Ghost Hunter Certification Class! If you and your family are looking for a really FUN weekend, Appalachian GhostWalks can put together a "Ghost Hunter Weekend" Package which includes the"Ghostology", or "Ghost Hunting" 101 class, as well as one more of their Haunted Historic GhostWalks and Tours located all across the Southern Appalachian Mountain region. These can include a stay at a haunted bed and breakfast, presentatations in your home, or at your place of business, birthday parties, and endless other possibilities. Upon completion of the class, participants receive a Certificate of Achievement and life-time membership with The ARC. For more information on all of our Ghost Tours in the Southern Appalachian Mountains please visit our website at www.AppalachianGhostWalks.com and visit www.AlternateRealitiesCenter.com to learn more about the Alternate Realities Center, or it's founder. places the client first above everything else. inclusion in “Weird Encounters” and “Weird Missouri” which will be published in the near future. Patrick Burns (born 1968) is an American paranormal investigator, best known as star of the TruTV (formerly Court TV) series Haunting Evidence. He is the founder of the popular website Ghost Hounds, which in 2001 was featured in an Emmy award-winning Turner documentary "Interact Atlanta - 'Ghost Hounds'". Burns is also the organizer and director of Ghostock, a paranormal investigators convention held twice annually in Savannah, Georgia and is a professional photographer through Patrick Burns Photography. A well-known paranormal investigator who has appeared on television and is the nephew of Ed and Lorraine Warren. This led into John's involvement with cases of possession and exorcism and working with prominent exorcists in this field. Roman Catholic priests, monks, Buddhists, rabbis and ministers. John has assisted and worked with well-known exorcists Bishop Robert McKenna, Malachi Martin and the Rev Jun. His research has taken him throughout the United States, Canada, England and Scotland covering several thousands of cases. 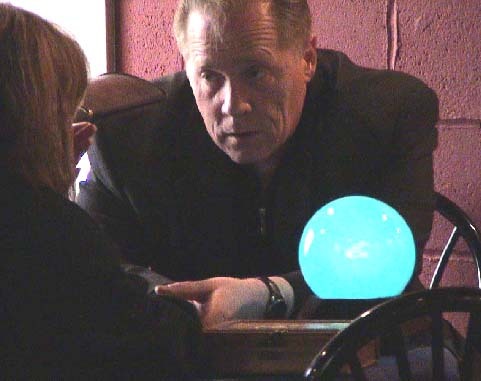 Through hands on investigating with other investigators and clergy, he has obtained a great deal of knowledge and understanding of the paranormal and is considered one of the foremost authorities in the field today. He runs the Paranormal and Demonology Research Society of New England which he founded in 1998. John has been featured in the Discovery Channel's documentaries A Haunting in Connecticut and Little Lost Souls. John has also appeared on Unsolved Mysteries, Fox News Live, and many other print and news media events. John is also in the books of Ed and Lorraine Warren Graveyards and In A Dark Place. John's first book, Shadows of the Dark, co-written with Brian McIntyre, was released in September, 2004. John is working on multiple follow-up books currently, and is lecturing all over the United States at colleges and universities. His second book The Trouble Within is due out in the Fall of 2006. The John Zaffis Paranormal Museum opened in 2004 and displays hundreds of artifacts collected over John's 30 years as a paranormal researcher and investigator. Zaffis has made appearances on Unsolved Mysteries, the Discovery Channel documentaries, Little Lost Souls and Haunting in Connecticut. Currently he co-hosts the Paranormal Nights radio show with Brendan Keenan. He runs the useum of the Paranormal located in Stratford, Connecticut. Jason Hawes (born December 27, 1971 in Canandaigua, New York) is the founder of The Atlantic Paranormal Society (TAPS), based in Warwick, Rhode Island. He is also one of the stars and co-producers of Sci-Fi Channel's Ghost Hunters, which has just started its fifth season.